The Friends of Manna House annual Big Swim on Saturday 24 February was once again another wonderful fundraising event. Staff, volunteers, clients, Friends of Manna House, funders and other supporters all joined in. There was an amazing atmosphere of love, determination, and friendship in the pool. Well-organised teams around the pool and on reception also did a marvellous job of welcoming everyone with smiles and encouragement. Many thanks to everyone involved in making this a very happy and successful event again this year. We will be collecting the sponsorship monies over the next ten days and will be able to publish the full result in due course. Our target is £4000 to help pay for sound-proofing for the offices in our new building. 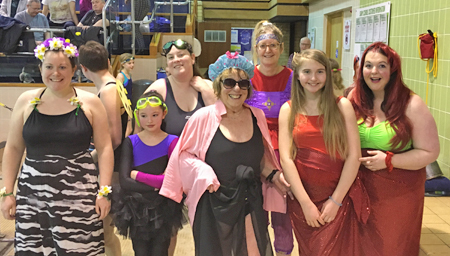 Pictured below with organiser Nina Bale are some of our Silly Swimmers.